When Emily Hopkinson complains to Napoleon Bonaparte about the habits of young American men in Napoleon in America, she says, “If a young lady should happen to accost one of those elegant figures, it is a considerable time ere she can be answered, as the gentleman must first dispose of the mouthful of delicious juice he has been extracting from a deposit secreted in one of his cheeks.” (1) The “deposit” to which Emily refers is chewing tobacco. 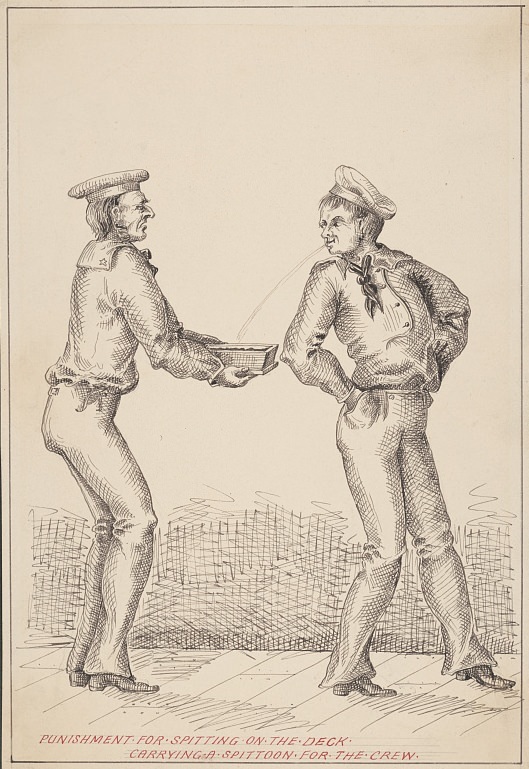 Disposal of the juice involves spitting – a practice early 19th-century Americans lustily engaged in, often without benefit of a spittoon. British visitors to the United States were appalled. I hardly know any annoyance so deeply repugnant to English feelings as the incessant, remorseless spitting of Americans. Even at the White House, “[c]onversation, tea, ice, music, chewing tobacco, and excessive spitting afford[ed] employment for the evening,” according to Henry Bradshaw Fearon, who toured America in 1817-1818. To Fearon’s regret, the practice was not confined to the nation’s capital. I disapprove most decidedly of the obsequious servility of many London shopkeepers, but I am not prepared to go the length of those in New York, who stand with their hats on, or sit or lie along their counters, smoking segars [cigars], and spitting in every direction, to a degree offensive to any man of decent feelings. As indicated by Emily Hopkinson’s remark, there were Americans who disapproved of the custom. Dr. Benjamin Waterhouse, co-founder of Harvard Medical School and saviour of John Quincy Adams’ portrait, took the view that a well-bred man “refrained from spitting in company, and in well-dressed rooms.” Dr. Waterhouse warned of the health consequences of spitting. The first effect of tobacco on those who have…already commenced the offensive custom of chewing or smoking, is either a waste or vitiation of the saliva. The Monthly Review, or Literary Journal, Vol. 105, 1824, p. 250. Adam Hodgson, Letters from North America, Vol. I (London, 1824), pp. 35-36. Frances Milton Trollope, Domestic Manners of the Americans (London, 1832), pp. 108, 34, 183. Henry Bradshaw Fearon, Sketches of America (London, 1819), pp. 291, 12, 249. William Faux, Memorable Days in America: Being a Journal of a Tour to the United States (London, 1823), p. 203. James Stuart, Three Years in North America, Vol. I (Edinburgh, 1833), p. 398. Benjamin Waterhouse, Cautions to Young Persons Concerning Health (Cambridge, 1822), pp. vii, 33-34. Mason Locke Weems, The Life of Benjamin Franklin (Philadelphia, 1835), p. 23. I was brought up in a (then) rural area in south of Montreal, Quebec in the ’70s. My family home was next to an old couple’s home whose garden was adjacent to our yard. The old man was growing tobacco plants and would dry the leaves in a small cabin in the back corner of his garden. Once dried, he would cut then chomp and spit. oh la la. We could follow his whereabouts everywhere around the area with telltale gobs of saliva. Another of his occupations would be to sit rocking chair next to his chicken coup and his wife with a makeshift spittoon between them. Needless to say, NOT the same thing! 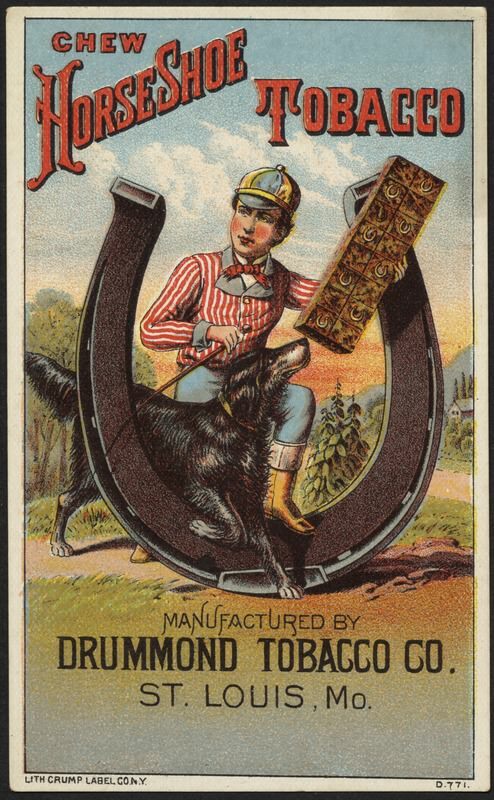 And I never did find out what the joys of chewing tobacco were but did learn in later years that it was a source of mouth and throat cancer. No joy in that, right? Definitely not! That must have tasted awful. Thanks for the great anecdote, Louise. When I was young, many older men still used spittoons. Of course, the cleaning of said items was left to the young girls of the house. I remember helping a friend clean her family’s spittoons. I gagged and vomited through the whole process. Nasty, nasty habit, which would end immediately if men had to clean up after themselves. I imagine you’re right, Terry. What a gross job! Thanks for the comment.